Anti-Aging Cane + Austin Review 2019: Worth Buying? Anti-Aging Cane + Austin Review: Does it Deliver What it Claims? Cane + Austin 30% Miracle Pad is a facial treatment for those who are interested in improving their skin tone, decrease the appearance of wrinkles and age spots, as well as fine lines. It is sold by Cane-Austin, a New York City company founded by Craig Austin, MD. A container of 60 pads starts at $88.00 plus shipping and handling. All purchases are final. Glycol Acid: Derived from cane sugar, this alpha hydroxy acid cleans the pores and is a leave-on exfoliant. Hamamelis Virginians (Witch Hazel) Extract: An extract that’s been used by Native Americans to treat skin problems, tumors, and acne. It also an anti-irritant that contains antioxidants that can improve the appearance of skin. Ammonium Hydroxide: This synthetic form of sodium helps maintain the proper pH in many beauty products, especially skin cleansers. Lactic Acid: This alpha hydroxy acid is derived from milk and is used exfoliate the skin and could possibly lighten age spots. In most formulas it is used synthetically for increased stability of the product. Sail Alba (Willow Bark) Extract: This extract contains salicin, which the body can convert into salicylic acid. It is an effective exfoliant and has anti-inflammatory properties. Tocopherol Acetate: A form of vitamin E, this ingredient has antioxidants that help restore the skin’s health. Use in the morning and at night. Swipe a pad over the face while avoiding the area around eyes. Those with sensitive skin can start by using one pad daily and then increasing to two per day. The formula causes tingling and this is normal. The pad is easy to use and comes with clear directions. Many of the ingredients included in the product’s formula are known for their skin benefits. Cane Austin was founded by a dermatologist. The product is free of fragrances and paragons. Select well-known beauty stores carry the product. Customer reviews of the product are mostly good. All purchases are final and there is no exchange policy, but orders can be cancelled before they are shipped. The product may irritate those with sensitive skin, which may necessitate reduced use of the pads. At $88.00 for 60 pads, the cost of the product may be a bit high for some consumers. The product only ships inside the US and Canada. 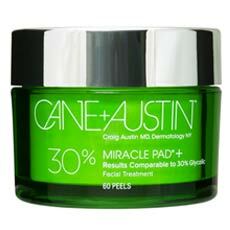 Cane + Austin 30% Miracle Pad uses many ingredients known to benefit the skin. The company was also founded by a dermatologist and is quite reputable. Also, the list of ingredients for the product is included so that customers can make an informed decision. Still, at $88.00 per bottle of 60 pads, the cost of the product is a bit high especially considering that the supply lasts an average of one month. There is also no return/exchange policy available, though customers can cancel orders before they are shipped. Some consumers may feel comfortable purchasing from a skin care company that provides a refund/exchange policy.